The most challenging part about designing any survey is to identify and create the right set of questions. Typically, there are two types of survey questions – open-ended questions and closed-ended questions. 1. What are closed-ended and open-ended questions? 2. When do we use closed-ended and open-ended questions? 3. What are some examples of the two question types? What Are Closed-Ended and Open-Ended Questions? Closed-ended questions ask the respondent to choose from a discrete set of responses, such as between “yes/no” or among a multiple-choice list. Open-ended questions, on the other hand, capture the respondents’ opinions and comments without suggesting a preset list of answers. Typically, closed-ended questions are used to gather facts about the respondent, while open-ended questions help gain their opinions or feedback. However, you should pick the most applicable question type on a case-by-case basis, depending on the objective of your survey. Most questions in a survey are closed ended because they help gather actionable, quantitative data. Let’s look at specific instances where closed-ended questions are useful. Gain quantitative insights: Since closed-ended questions have discrete responses, you can analyze these responses by assigning a number or a value to every answer. This makes it easy to compare responses of different individuals which, in turn, enables statistical analysis of survey findings. For example, if respondents were to rate a product from 1 to 5 (where 1=Horrible, 2=Bad, 3=Average, 4=Good, and 5=Excellent), an average rating of 2.5 would suggest that the product is perceived as below average. Further, a high standard deviation would imply that people’s perceptions are extreme. Here’s why quantitative research is indispensable to your study. Limit the set of responses: Closed-ended questions have a specific set of responses. Limiting the scope of possible responses helps remove ambiguity, ensures consistency, and allows the study of distribution of a certain parameter across the population. For example, if you ask the open-ended question “Tell me about your internet usage”, you will end up with lots of unique responses (such as “2 hours per day”, “all the time”, “when I feel like it”) that cannot be analyzed easily. Instead, you can use the multiple choice question “How many hours per week do you use the internet?” with response options like “0-5 hours”, “5-10 hours”, and so on. Then you can easily analyze the data and report a clear result like “63% of respondents use the internet less than 5 hours per week”. Conduct large-scale surveys: Since closed-ended questions typically gather facts about a respondent, they take less time to respond to and are preferable when the size of the sample population is quite large. For example, the Census of India gathers information on household assets using a multiple-choice list with the names of items (such as fan, AC, mobile phone, landline connection, 2-wheeler, 4-wheeler, and so on). The respondents can quickly tick all the items that they own in this list, rather than recalling all items they own and listing them in an open-ended question. Saving even one minute per survey can save weeks of time for the Census, which surveys 97-98% of India’s population. Do you think this product would be useful? What are the top reasons for you to purchase a product? Indicate your agreement with the following statement by circling the number on the scale which most closely represents your opinion. Do you believe adding this additional feature will make this product useful? A tabular Likert scale is useful when multiple questions have the same set of options. Open-ended questions help identify additional concerns or opinions from the respondent that have not been captured by closed-ended questions in the survey. Let’s look at some particular instances when open-ended questions are useful. Open-ended questions are useful for surveys where you want to gather detailed opinions from a small set of people. For example, an HR personnel looking to improve the quality of communication between employees can include open-ended questions to gain critical insights on communication barriers in a team. A pilot or preliminary research study helps you test your survey, identify and fix data quality issues, and better understand your survey audience before conducting a large-scale study. Open-ended questions are useful in pilots, since they can help you learn which questions to ask and how to structure them in your final survey. For example, before conducting a large-scale survey on a particular product with a sample size of 5,000 respondents, you can conduct a pilot survey with a sample size of 50 respondents. The insights from this sample study can be used to design an appropriate questionnaire for the larger sample. Here are 11 tips you should know before you pilot your survey. It is usually a good idea in any survey to leave an open-ended comments section at the end of a survey. A comments section is important to gain other opinions that may be useful for your research. For example, if your survey consists mainly of closed-ended questions on the features of a product, you can add an open-ended question at the end asking for the respondent’s opinion on any additional features that they might like or prefer in the product. Here’s how qualitative data collected from open-ended questions can be quantified. What are some of the most important decisions you’ve made related to your child’s education? What is your opinion about the current political situation? How would you react to these outcomes? 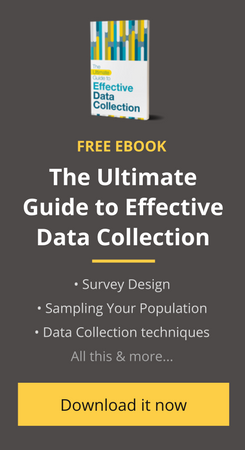 Although open-ended questions allow survey participants to elaborate on a particular issue, closed-ended questions are essential for uncovering quantitative insights from large samples of the population. It is probably best to use a combination of the two, with more closed-ended survey questions for large-scale surveys. Whether your surveys contain closed-ended or open-ended questions, collecting data in the field is always easier with a mobile app. We’ve helped over 150 partners collect over 20 million data points through our mobile data collection app Collect! Note: This article was originally published on 23 May 2016, then refreshed and updated on 09 October 2017. Thank you for this very important ebook that ghive us all the tools to succeed our open-ended questions, etc. Big up to you. Really a very good information about close and open ended questions for any survey. For the first time I read about this in detail and it clears my concepts.